Happy Sunday everyone! I hope you are having a good weekend! We are just beginning ours since D is off Sun, Mon, and Tues. Last week was so busy, I'm hoping we get to take it easy this weekend. I just wanted to share a quick card I made. This uses Victoria Case's digi stamps Robby. Isn't he cute? I think he's perfect for a little boy birthday card. I used paper from an older Cosmo Cricket line. There are also some dew drops in the corners for some added dimension. OMGosh this robot is so cute. I just love the DP. You always inspire me. Enjoy the time with the family. How simply adorable. Great card for a boy. 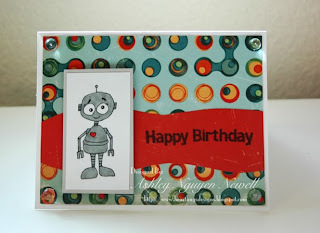 Ashley, you made this card soooo cute and so boyish!!! I luv that digi stamp so much...but I think it's too boyish for my soon to be 14 Yr old! 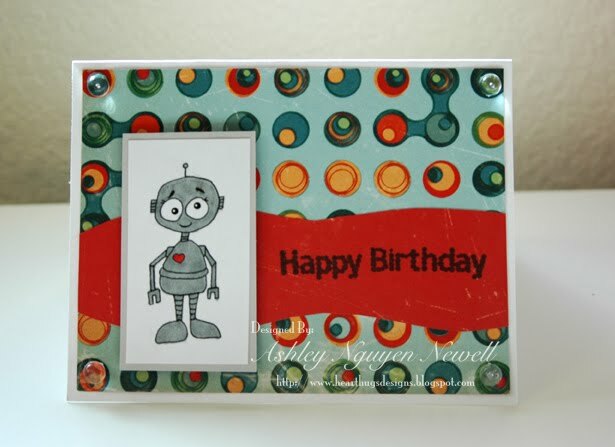 heehee But a great robot stamp!